Aphthous ulcers are also known as canker sores. They are painful, temporary sores that may occur anywhere in the mouth. The sores can occur one at a time or as a group. 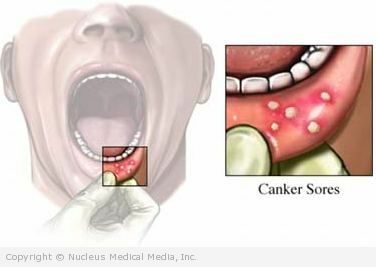 Although canker sores are not serious, other mouth sores may be. If you suspect you have this condition, make an appointment to see your doctor. No one knows what causes aphthous ulcers. It is a common misconception that they are a form of the herpes virus. Unlike herpes, aphthous ulcers cannot spread from one person to another. They are thought to result from a reaction of the immune system. They tend to occur more often in women than in men. The first instance tends to occur between the ages of 10-40. If you experience any of these symptoms, do not assume it is due to aphthous ulcers. Mouth sores similar to these may be caused by other more serious conditions. Aphthous ulcers have various sizes. They typically occur on the inner surface of the cheeks and lips, on the tongue, and the soft palate. Usually they are an open, shallow grayish sore with a slightly raised, yellowish-white border, surrounded by a red border. Some people get aphthous ulcers two or three times per year. Others develop lesions continually one after another. Usually the most painful phase is the first 3-4 days, and then the sores begin to heal. Your doctor will ask about your symptoms and medical history. A physical exam will be done. Looking at the sores is the primary way to tell the difference between aphthous ulcers and other more serious mouth sores. In certain cases, the doctor may take a small sample of a sore for microscopic tissue examination (a biopsy) or order cultures or blood tests. It is especially important to examine mouth sores that do not heal within two weeks. They may be a sign of cancer. An oral rinse (eg, viscous lidocaine, amlexanox, diphenhydramine mouthwash, Maalox Advanced Regular Strength liquid) may be used every three hours or before meals. This provides short-term relief from pain caused by aphthous ulcers. In addition, over-the-counter, anti-pain oral gels can be applied directly on the sores usually four times daily to numb the area and relieve pain temporarily. For multiple sores, a liquid form of the antibiotic tetracycline can be used as an oral rinse four times daily for 10 days. The liquid can coat the ulcers and prevent new ulcers from forming. Sometimes, as a side effect, this treatment can cause an oral infection called candidiasis, or thrush, which is easily treated. For severe outbreaks of minor or major aphthous ulcers, steroids may be taken. It is usually in the form of a liquid oral rinse after meals and at bedtime. Steroids help reduce inflammation of the mouth caused by severe sores.